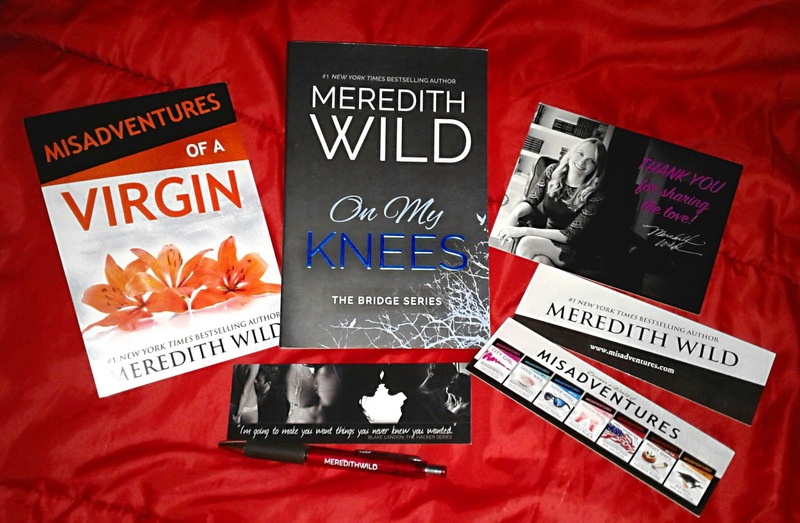 Because my memory is so abysmal, I forgot I won a giveaway on goodreads and so I had a mystery parcel at the post today that was from author, Meredith Wild, and she included some goodies! A signed copy of On My Knees the first of The Bridge series, bookmarks, a pen (I love pens), and a little card for another of her books that I HAD to add to my TBR list. I also printed out some bookmarks I found on pinterest - I have an entire board dedicated to bookmarks. What is wrong with me? I attached the bookmarks to some colourful cardstock and did a dreadful job of cutting them. I'll definitely stick to ordering bookmarks on Etsy or picking them up at the bookstore. And I'll stay on the crafty side of arts and crafts. Art hates me.